The asteroid-mining company Planetary Resources and its partner 3D Systems have 3D-printed an object made of powdered asteroid metal. An asteroid-mining company is giving the world a glimpse at its vision of the future. Planetary Resources, which aims to extract water and other useful materials from asteroids, has 3D-printed an object using metal powder gleaned from a space rock. "The asteroid (or meteorite) used for the print materials was sourced from the Campo Del Cielo impact near Argentina, and is composed of iron, nickel and cobalt — similar materials to refinery-grade steel," they added. 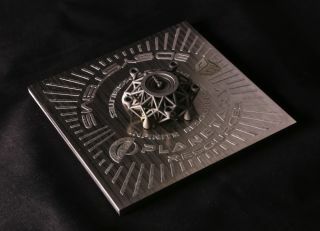 Planetary Resources worked with the company 3D Systems to build the complex geometric object, which was unveiled Thursday at the Consumer Electronics Show in Las Vegas. Another look at the geometric object 3D-printed by asteroid-mining company Planetary Resources and its partner 3D Systems using powdered asteroid metal. Planetary Resources, which is based in Washington State, isn't the only entity that views 3D printing as a key technology in the spaceflight arena going forward. For example, NASA officials have said 3D printing could help open up the solar system to human exploration, by making voyaging spaceships and off-Earth outposts less dependent on their home planet for supplies and spare parts. Planetary Resources already has a spacecraft in Earth orbit, a tiny cubesat called Arkyd-3R that deployed from the International Space Station last July to test avionics, software and other key technology that future asteroid-mining probes will need.